On The Third Day, The Lord Created the Remington Bolt-Action Rifle So Man Could Defend Hisself Against the Dinosaurs. This is a work of the imagination intended to reflect a common stereotype. Any resemblance to homeschoolers, living or dead, is strictly coincidental. In case I didn’t tell you before: I homeschool our kids. It’s a choice that raises a lot of eyebrows, especially among the many Europeans we encounter in the former colonial capital where we live. “Do you do that for…religious reasons?” a German woman asked me. There was caution in her voice, as if she feared she was inquiring about some kind of bizarre and possibly gruesome secret rite. Another woman told me she doubted that I’d make any friends if I didn’t enroll my children in school. Others ask me—every time they see me—if I am going to keep doing that. We don’t teach our kids at home because we are afraid they’ll learn something at school that conflicts with our religious views or our values, as was perhaps the primary motivation behind the pioneer wave of Christian home educators. (This might well remain a leading reason why many parents today homeschool their children.) I support state oversight of homeschooled students and fear the Home School Legal Defense Association’s influence, which often comes dangerously close to defending child abuse in the name of “parent’s rights.” At the same time, I’m irritated by the widespread prejudice against homeschooling that is perpetuated by misleading news reports, such as this piece by Michelle Goldberg. She claims that homeschooling “is almost entirely unregulated in much of the country” and opens by telling the story of a girl who died at the hands of her abusive parents. 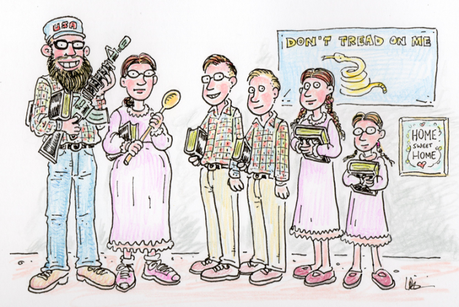 They were homeschoolers, of course. Homeschooling has fallen out of favor among the demographic I most closely fit: young, “missional”-minded Christians. Last year, progressive Christian blogger and author Tony Jones argued, in a piece unsubtly titled “Death to Homeschooling!”, that homeschooling probably is anti-Christian. Jones wrote: “[T]o withdraw my children from public education is to not play my (God-given) role as a missional member of society.” Recently, Jennifer Slate, writing for Christianity Today’s “This is Our City” project, explained that sending her kids to the “poorest public school in the city” has helped her engage with what she believes God is already doing “for the common good” in her area.